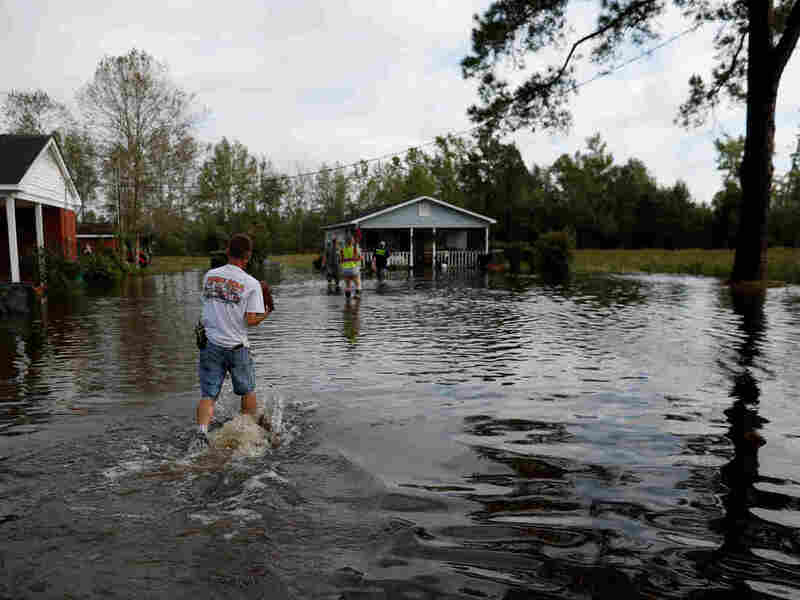 Florence Death Toll Rises To 32 As Rivers Continue To Flood In N.C. And S.C. A toddler's body was recovered on Monday, North Carolina Gov. Roy Cooper said. Moody's Analytics estimates the cost of now-Post-Tropical Cyclone Florence's damage at $17 billion to $22 billion. 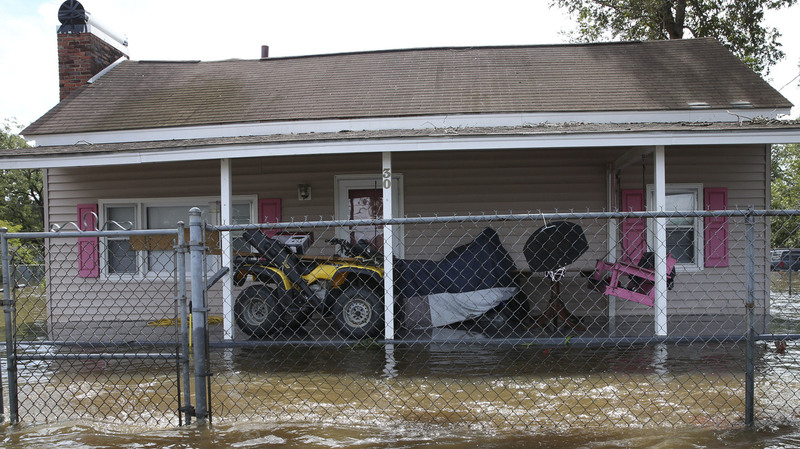 A house is surrounded by flood water in Lumberton, N.C., on Monday. Its 11 p.m. update said, "Florence is expected to produce heavy to excessive rainfall through Tuesday. Portions of the northern Mid-Atlantic states and southern New England are expected to receive an additional 2 to 4 inches of rain...with isolated maximum amounts of 6 inches possible." The center of the storm was about 105 miles northwest of New York City and 100 miles west of Philadelphia. A National Weather Service map shows the persistent flooding Florence left in the Carolinas. 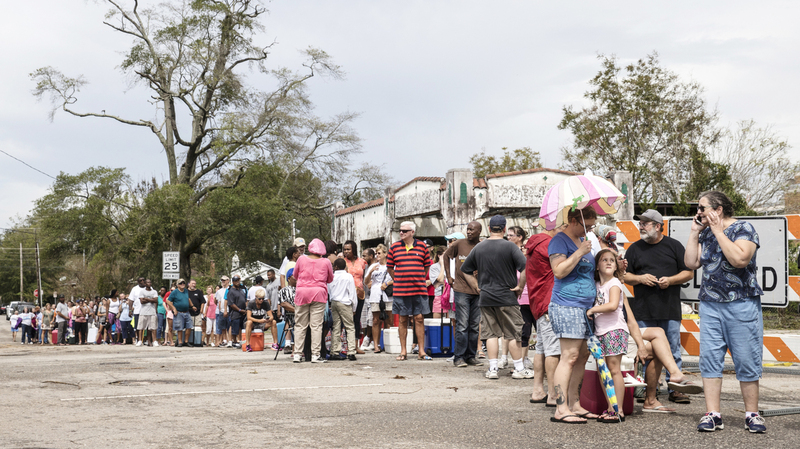 People wait in line for ice in Wilmington, N.C., on Monday. The storm is blamed for at least 32 deaths, say officials quoted by the Associated Press. Twenty-four of those were in North Carolina. Life-threatening floods are expected to continue all this week, according to the National Weather Service. In Virginia, one person was killed as a result of a tornado associated with Florence, the Chesterfield County Fire Department told local station WHSV. The tragic toll in North Carolina includes a toddler who died in Union County; Kaiden Lee-Welch, 1, was swept away from his mother, whose car had been overcome by floodwaters. The local sheriff's office said Kaiden's mother had apparently driven around barricades on Highway 218. A prolonged search and rescue operation led to the recovery of the boy's body Monday. Particularly in eastern North Carolina, conditions "remain extremely dangerous," Cooper said. He added: "Don't drive around barricades. We're seeing this happen now, and the result is not good." For many towns in the state, "the danger is still immediate," Cooper said, despite the promise of clearing skies as rainy weather finally starts to leave the state. In an advisory, North Carolina transportation officials warn that road conditions are still deteriorating. "Although the storm has passed in some areas, travel conditions across the state are deteriorating as flood waters continue to rise and trees fall because of saturated grounds. "Additionally, GPS navigation companies are not keeping up with all the road closures and are directing people onto roads that are confirmed closed and flooded. "NCDOT maintenance crews are assessing roads as weather conditions allow. The number of road closures is expected to rise." "Close to two dozen towns, cities and counties have issue overnight curfews for their areas, warning residents of the dangers of driving on flooded roads at night," NPR's Sarah McCammon reports. Emergency crews have rescued 2,600 people and more than 300 animals, Cooper said. He added that there are currently more than 14,000 evacuees in shelters in his state. Members of the Marion Rural Fire Department hand-deliver supplies to a homeowner flooded by rains from Florence in Marion, S.C., on Monday. With the full picture of the disaster still emerging, Moody's Analytics has estimated the cost of Hurricane Florence's damage at between $17 billion and $22 billion, making it one of the 10 most costly hurricanes in U.S. history. The bulk of that figure is in property losses; lost economic output accounts for $1 billion to $2 billion of the total. Officials at Duke Energy's Brunswick nuclear plant have declared a state of emergency as the the 1,200-acre complex remains cut off by flood waters and is inaccessible to outside personnel. The twin-reactor plant is about 30 miles south of Wilmington and 4 miles inland. It is stable and poses no threat to public safety, according to Nuclear Regulatory Commission spokesman Joey Ledford. The facility has off-site electricity from the power grid to cool the nuclear reactors and radioactive nuclear waste at the site. "North Carolina environmental regulators say several open-air manure pits at hog farms have failed, spilling pollution. State officials also were monitoring the ongoing threat from the breach of a Duke Energy coal ash landfill near Wilmington. Department of Environmental Quality Secretary Michael Regan said Monday that the earthen dam at one hog lagoon in Duplin County had been breached. There were also seven reports of lagoon levels going over their tops or being inundated in Jones and Pender counties." In Pollocksville, N.C., a task force team from New York City is helping stranded residents, using boats to patrol streets that have become waterways. "As of Monday afternoon, the N.C. Department of Transportation reported approximately 1,200 road closures – including interstates 95 and 40, numerous highways and other primary routes in North Carolina – due to flooding and debris from Florence," according to a press release issued by the department. The road closures complicate relief efforts and frustrating evacuees who have sought to return to coastal areas. Parts of I-95 were also closed in South Carolina, along with a number of highways in the eastern portion of the state. The S.C. DOT reports more than 150 road closures related to high floodwaters. Some 389,889 customers in North Carolina as of Monday afternoon and 10,000 in South Carolina are without power. Many schools remain closed or have delayed opening times — prolonging a disruption that began in many places last Tuesday, when evacuation orders took effect. Images from beaches along the coastline show devastated dunes — their sand spread flat over streets and yards. In one striking photo, two houses were left standing on their pilings — but the dunes in front of them have vanished. Thousands of people are in shelters in North Carolina. More than 2 feet of rain has fallen in some areas, and many rivers hadn't yet reached their crest on Monday, as they struggle to deal with four days of heavy rain from the large Category 1 hurricane. "Most main-stem rivers across central N.C. will flood," the National Weather Service office in Raleigh said on Monday, adding, "the Neuse, Cape Fear, Haw, Deep, Rocky and Little Rivers are currently in flood." The Cape Fear River at Fayetteville is forecast to hit a crest height of nearly 62 feet — far above the 59 feet it hit during Hurricane Matthew in 2016. Hundreds of thousands of people obeyed evacuation orders along the Carolina coast. Some of them tried to return home on Sunday, only to be stymied by closed roads, as creeks and rivers continued to flood. "Due to flooding in southern, central and eastern N.C.," the state's transportation agency told motorists they should "not travel through these parts of the state." Days After Hurricane Florence Made Landfall, Flooding Remains A Large Threat In N.C. In Kinston, where water overran the banks of the Neuse River in the city in eastern North Carolina, a crowd of people gathered on Riverbank Road to look at the changed landscape of Neuseway Nature Park. "Lots and lots of water. Like, you can't see the swings anymore," Lashieka Becton said, describing the scene to NPR's Brakkton Booker. "You can't see the parking lot anymore, just ... I don't know what to think." At Mother Earth Brewing, educators Tori and Wes Hazelgrove told Brakkton that they're tired of this storm. "We're just kind of in a period of waiting to see like, how bad is it going to get," said Wes Hazelgrove, who said he spent days preparing for the storm. "It's like a period of being in limbo." District attorney Ben David said that the court can impose civil penalties of up to $5,000 on price gougers for each violation. "These folks who are coming into our community are typically from somewhere else, they have come specifically for the storm, and frankly we need their help, and many are good honorable people, not all of them are. Ask your neighbor who they used and their experience," he said. In South Carolina, Gov. Henry McMaster has lifted all evacuation orders for the state, but residents still face delays and detours as they try to find roads to take them home, and farmers report finding their crops inundated with floodwater. Outside Myrtle Beach, a stretch of the normally busy Highway 501 was reopened early Monday. But closer to the coast, work crews were hoping a flood barrier would make the road — or at least half of it — safe to use. On Monday, President Trump declared a major disaster in South Carolina, listing eight counties: Berkeley, Charleston, Dorchester, Georgetown, Horry, Marion, Orangeburg and Williamsburg. The president had already issued a similar declaration for North Carolina, easing the flow of federal aid to the states. Cooper said 18 North Carolina counties have been declared disaster areas, with more likely to follow. Ruben Kimmelman contributed to this report.